They’re ultimate symbol of the keen allotment holder, and mine are no exception. Since taking on the allotment in 2013 is been a bit of a roller coaster ride with a few successes and mishaps along the way. The biggest mistake of mine was to let the allotment run wild and i no longer had an allotment…i had a jungle. I’ve spent the best part of 2014 taming the jungle and I’m now ready to start growing veg, and lots of them. 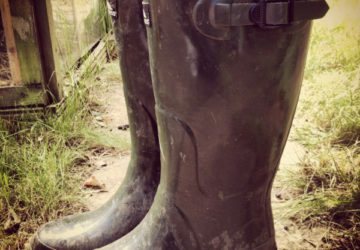 I hope to keep my green wellies muddy for many years to come.